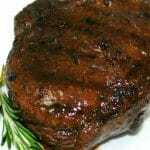 Wine & Balsamic Marinated Filet Mignon made with dry red wine, mustard, balsamic vinegar and fresh rosemary is an easy marinade that's perfect for rich meats like beef. Whisk all ingredients together until well blended. Add the meat and the marinade to a resealable bag and refrigerate for at least 2 hours. Discard marinade and let rest at room temperature at least 15 minutes prior to grilling to your desired internal temperature.